…is there a way to trade Trump’s tweets? It’s just not what most investors would expect. Love him or hate him, 16.9 million people cannot get enough of “The Donald” on Twitter. Whether that’s a good thing or a bad thing is moot. What matters when it comes to your money is very simple – his comments move markets. Investors and traders alike need gobs of information to make money. And these days, the faster they get it, the better and more potentially profitable it is. Back in 2006, traders and investors had to sort through a mere 4 billion messages a day. Today, that figure stands north of a staggering 205 billion emails a day – or roughly 2.4 million emails per second, and 74 trillion emails a year. Then you’ve got to add on another 303 million tweets a day and throw in the traffic from nearly 750 million Facebook users just for good measure. Plus Pinterest, LinkedIn… and… yeesh! It’s no wonder that algorithmic trading now accounts for an estimated 70% or more of total market volume. Humans literally cannot keep up. The implication, of course, is that computers can. That’s what potentially makes “The Donald” so appealing. He’s outside the system, both literally and figuratively. Using social media to identify tweets and trends isn’t new. In fact, hedge funds have been working with social data for years. It’s simply the tools that have changed. For example, an analyst may have counted cars in the parking lot outside Wal Mart in the old days as means of validating the company’s earnings projections or counted the number of people eating at certain restaurants or even tallied gasoline trucks leaving a refinery to reverse engineer capacity numbers (which I actually did in China a few years back – but that’s a story for another time). These days they’re far more likely to use “crawlers” that scrape specific websites for job information, customer testimonials, complaints, FDA filings and more. A programmer friend of mine was even hired to write code that posted and cancelled tickets on travel websites as a means of figuring out how many seats the airlines have left on a given day. Creativity obviously counts because anything that is a breakthrough potentially gives you an edge when it comes to finding the next best winner. And that brings me back to President-Elect Donald Trump and why you want to pay attention. Trump took The Boeing Company (NYSE:BA)to task at 5:52 A.M. on Tuesday for its overly lavish federal contract. Not surprisingly, the company’s stock opened 1.54% lower in a move that wiped more than $1 billion in capitalization from the books. 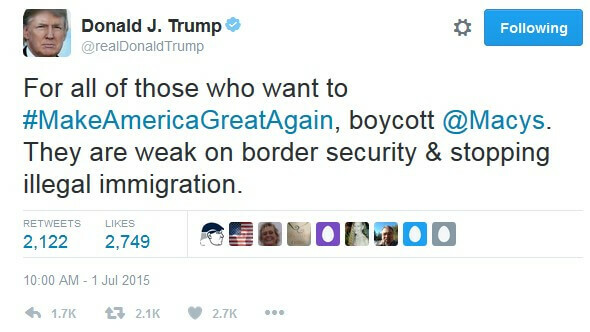 July 2015, he took to Twitter to urge a Macy’s Inc. (NYSE:M) boycott after they condemned his comments on illegal immigration, and the stock tanked more than 40% in the following months. 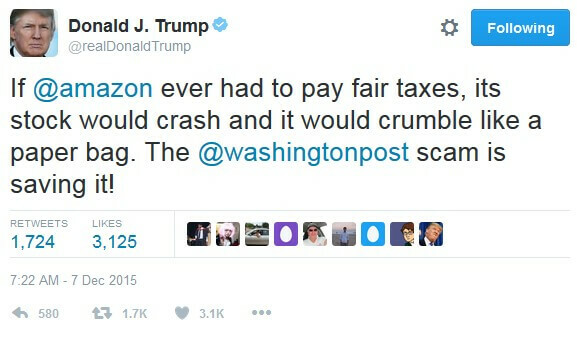 He had this to say about Amazon Inc. (NasdaqGS:AMZN) in December 2015. Since his election, he’s issued 61 fleet-fingered tweets, each one of which was potentially worth millions. Thankfully, he shows no sign of slowing down – at least from an investment perspective. Again, I’ll leave it to you as to whether or not this is a good thing or not. My job is to help you make money, and the fact that he’s a twitter maniac means you’ve got an opportunity on your hands every time his fingers get busy. There are two ways to plays this – by device and by content. Let’s talk about devices first. I’ve spent a good deal of time analyzing “Trumpeets” and those that come from his personal Android seem to be more impactful than those that come from other devices. That suggests to me that they originate from the man himself rather than from his staff. As such, they’re unfiltered – and potentially far more profitable. His comments on Macy’s Inc. (NYSE:M), The Boeing Company (NYSE:BA), McDonald’s Corp. (NYSE:MCD), Amazon Inc. (NasdaqGS:AMZN), Tiffany & Co. (NYSE:TIF), and Deere Co. (NYSE:DE) stock all fit that profile, for instance. Most investors are hung up on Trump’s content. Love it or hate it, they cannot move beyond the message. That tells me the computers cannot either, which means you’ve got an edge if you know what to look for. 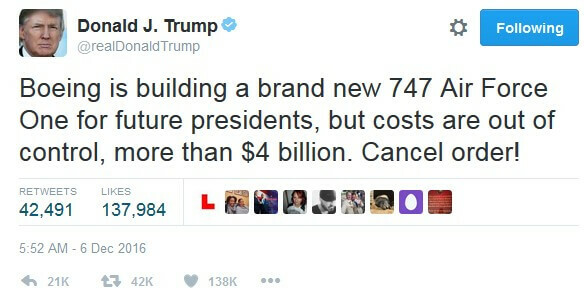 Take Trump’s Air Force One comment when he let Boeing have it with both barrels and suggested cancelling the company’s contract, for example. 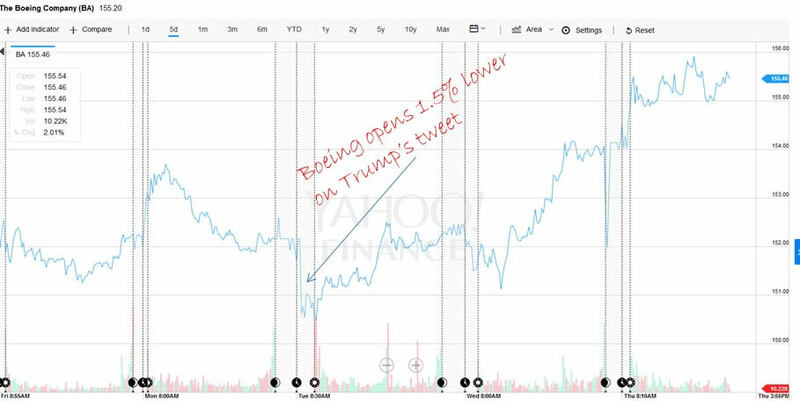 It took the markets a full 10 seconds to react and for Boeing stock to begin its dive despite the fact that he posted hours earlier because the computers that routinely scrape other social media, email, and the Internet had no idea how to perceive his observation. That’s going to change very rapidly as Trump’s tweets begin to mirror social expectations but it’s a start. Obviously, I don’t expect you to trade in 10-second increments. Leave that to the high-frequency crowd who’s just as likely to get skinned as they are to profit. Treat Trump’s Tweets as you would any other data source. Take emotion out of the equation because it will limit your profit potential. Create a buy list of companies you want to own and use Lowball Orders as a means of swooping if and when one of ’em is the subject of his next social rocket. They’ll falter… then recover when computers spot the aberration and capital catches up. The first two items are pretty simple, but item three is a bit more nuanced. I can hear the wheels spinning… how on earth do you pick which companies he’s likely to target? By taking a look at what he wants to accomplish and who stands in the way. Trump’s got it out for any company that’s squirreled away cash overseas, which means that Apple Inc. (NasdaqGS:AAPL), Alphabet Inc. (NasdaqGS:GOOG), and Amazon Inc. (NasdaqGS:AMZN) are probably on his list along with dozens of others. And, pay particularly close attention to companies that have previously announced outsourcing plans because he’s going to be lasering in on them shortly. Examples include Ford Motor Co. (NYSE:F) and General Motors Co. (NYSE:GM). I’ve just scratched the surface here, but I hope I’ve made you think. 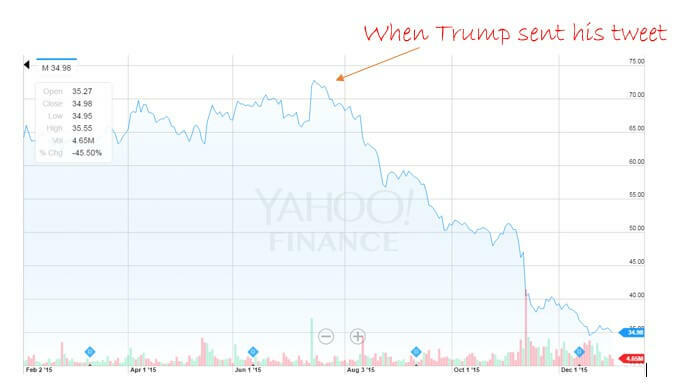 Never forget that the best investment opportunities are frequently found in the most unlikely places and Trump’s Twitter account could be one of the most unlikely of all. Whoever controls the information controls the fight and, of course, the profits. What devices do I need to listen to TRUMPS TWEETS?